Recipe 29: In the office they decide to organize a little Halloween party and i wanted to help out with some food. But what i could cook considering we don’t have any oven? It also has to be something easy to bring. So because someone else was thinking about the desserts, and we were going to have cheese and wine all night, i decided to prepare some Insalata russa, that you can easily eat with bread and crackers. Ingredients for a starter for 8 people: 3 big potatoes, 5 carrots, 150gr peas, 5 eggs, some anchovies in olive oil, some capers, half of a little spoon of mustard, a lemon, a glass of olive oil, a bit of vinegar, salt and pepper. For the mayo i suggest you to use a mixer because otherwise it will be very hard to maintain always the same speed and strength. However add 2 egg yolks with a pinch of salt and start to mix, better if with a wooden spoon and always in the same sense. At this point you will add the olive oil little by little and with some lemon juice drops too. 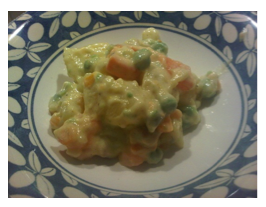 After a bit the mayonnaise will start to become thicker, so you can add the remaining lemon juice always mixing a bit. Wash, peel, cut and cook all the vegetables in different pans and when boiled, cut them in little pieces. mix this with the peas, the mayo the capers and the anchovies finely chopped, salt, pepper, a bit of vinegar and mustard. Boil the other three eggs and place it on the salad as a decoration. Place everything in the fridge and enjoy after some hour. Cold it’s better! 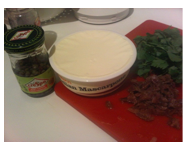 Otherwise another good mix is Mascarpone with capers, anchovies and parsley! That’s really great. PS. Mamy la tua insalata russa con la maionese fatta a casa e’ stata un successo! Diciamo che dopo avre provato una volta a farla a mano sono subito andata sul robot da cucina perche non riuscivo piu’ a mescolare, ma il risultato comunque non ha nulla a che vedere con quella che compri! Se la sono finita tutta in ufficio!